Brisbane is the third most populous city in Australia and it features an important international airport which services approximately 25 airlines currently. Passengers who use this airport can fly to more than 40 national destinations and up to 28 international destinations. In 2013 alone, this airport has been used by approximately 22 million passengers. Here are more interesting details about Brisbane Airport, one of the largest and most visited in Australia. The first terminal of the Brisbane Airport is the international terminal which has been built in 1995 and it currently features 12 bays with aerobridges. From these 12 bays, 2 of them are capable of accommodating large aircraft such as an Airbus A380. This terminal also has 4 levels. The first level is used to house airlines, luggage handling and the tourism operators, the second level is used to handle arrivals, the third level is used to house the departure lounge, and finally, the forth level is used to house the departure check-ins. This terminal also features a car park that is five-story long as well as a smaller car park situated very close to the international terminal. The other terminal of the Brisbane Airport is the domestic terminal and it features 3 different areas. It the upcoming future, this terminal will undertake a serious upgrading process in order to improve the services and facilities within the terminal. If you are travelling to Brisbane from abroad you may wish to enquire how we can help you to arrange transport for both legs of your journey. If you are travelling to Australia from the UK, please visit our partner site London Minibus Ltd to book group travel for up to 24 people. This large airport is served by 2 railway stations. The first railway station belongs to the international terminal and it is elevated. The domestic railway station is the second one and it is also situated in close proximity to the international terminal. Both of these train stations are privately owned and operated by Airtrain consortium. The trains travel to Fortitude Valley and the central business district of Brisbane. Most of the trains that leave these stations will also continue their journey towards the Gold Coast. The trains are operated from 6AM to 10PM and the services usually run every 30 minutes or every 15 minutes during the busiest days. The second transportation method available at Brisbane Airport is used to make transfers between terminals. An inter-terminal bus that connects the two terminals as well as the Skygate shopping complex can transport passengers to various destinations such as the Novotel hotel or other places. The services run from 5AM in the morning until 11PM for inter-terminal transfers. Brisbane Airport also features several car parks which are operational 24/7. Both the international and domestic terminals provide short term and long term parking options to tourists and passengers. Valet parking is also possible at the domestic terminal and the total car spaces available at Brisbane Airport can reach 9,000. The domestic terminal also includes services like vehicle cleaning. In the recent years, the Brisbane Airport has been renovated and modified in order to be capable of accommodating large and luxurious aircraft such as the Airbus A380. In fact, the first A380 that arrived in Australia landed at the Brisbane Airport on 14 November 2005 and the first passenger A380 landed on the Brisbane Airport 5 years later, on 8 November 2010. The latter plane had to be diverted away from Sydney because the weather wasn’t suitable enough for landing the aircraft safely. The longest runway in the Brisbane Airport is approximately 11,500 feet long (3,500 meters) and it features a surface made from asphalt. The second runway is approximately 5,600 feet long (1,700 meters) and it is also asphalt paved. In September 2007, the government approved the construction of another parallel runway which will be approximately 11,800 feet long (3,300 meters). It has been estimated that it will take no less than 8 years to build this long runway. An investment of approximately $1.3billion has been allotted by the government for this project. This runway is built on swamp land and it will be situated approximately 2 kilometres (1.2 miles) west of the terminals. This impressive Australian city featured 2 main airports back in the days which were constructed in the 1920s. These 2 airports comprised the Archerfield Aerodrome on the south of the city and a relatively small runway situated close to the Eagle Farm. The small airport at the Eagle Farm was used extensively during the World War 2 and it quickly became the busiest airport in Brisbane. The current Brisbane Airport was founded in the 1970s and it is built in an area called Cribb Island. The Brisbane Airport has been privatized in 1995 and since then it has expanded continuously, accommodating more and more passengers and aircraft every year. This airport has been rated as the number one airport in Australia when it comes to quality of service. The Brisbane Airport received this award 10 years in a row, from 2005 to 2014. It has also been ranked as the third best airport in the world and the international terminal received an award for its impressive architecture. Approximately 10 years ago in 2005, the Brisbane Airport received the famous IATA Eagle Award. Only 2 airports in Australia have received this prestigious award. If you are visiting Brisbane in the near future, it would be a good idea to make prior arrangements so you will be picked up on time at the Brisbane Airport and travel towards your destinations in this magnificent city. 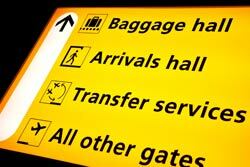 Airport transfer services are affordable and you should take advantage of them to avoid time wastage. Our company specializes in airport transfers to and from Brisbane Airport, so make sure that you contact us for more details. Our drivers will help you with your luggage and ensure that you enjoy a comfortable and pleasant ride. Also, our fleet is extensive and our airport transfer services can be completely tailored and customized according to your needs and preferences.